Recent release “Tunnel Tree” from Page Publishing author Howard Gershater is an autobiographical reflection on a nation in the throes of cataclysmic social change, his friends and lovers, and his most faithful traveling companion, an Irish setter named Teale. 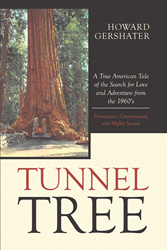 Howard Gershater, a jack of a great many trades who has hitchhiked and driven across the United States twenty times, has completed his new book “Tunnel Tree”: a timeless story of restless youth while an evocative memoir of the Free Love generation. Howard Allen Gershater loves being alive and his story is a tale of living life to the fullest. In search of a dream, he finds love and uncovers a slice of American history. Howard is a spokesperson from an era of love, just wanting peace. Published by New York City-based Page Publishing, Howard Gershater’s wide-ranging story of friendship, love, and adventure in Vietnam-era America. Readers who wish to experience this evocative work can purchase “Tunnel Tree” at bookstores everywhere, or online at the Apple iTunes store, Kobo, Amazon, Google Play or Barnes and Noble.